China will seek support for a Beijing-led Asia-Pacific free trade area at a regional summit in Peru later this month, Chinese officials said on Thursday, after Donald Trump’s U.S. election win dashed hopes for a U.S.-led free trade pact. During his election campaign Trump took a protectionist stance on trade issues and labeled the Trans-Pacific Partnership (TPP) championed by President Barack Obama a "disaster". There is now little chance of it coming up for vote in Washington before his inauguration in January. Obama had framed TPP, which excluded China, as an effort to write Asia’s trade rules before Beijing could, establishing U.S. economic leadership in the region as part of his "pivot to Asia". Briefing journalists ahead of President Xi Jinping’s departure for the Asia-Pacific Economic Cooperation (APEC) summit in Peru from Nov. 19-20, China’s Vice Foreign Minister Li Baodong warned of the rise of protectionism and said the region needed a free trade agreement as soon as possible. "Trade and investment protectionism is rearing its head, and Asia-Pacific faces insufficient momentum for internal growth, and difficulties in advancing reforms," Li said. "China believes we should set a new and very practical working plan, to positively respond to the expectations of industry, and sustain momentum and establish a free trade area in Asia-Pacific at an early date," Li said. Aside from Peru, Xi will also make state visits to Chile and Ecuador during a week-long trip to Latin America. Peru and Chile are both party to the now endangered TPP. China has proposed the Free Trade Area of the Asia Pacific (FTAAP) and the Regional Comprehensive Economic Partnership (RCEP), which some observers see as competitors to the TPP. Li said Xi’s attendance showed China’s "confidence in promoting the FTAAP process". "China is always positively advancing work on its own regional free-trade strategy. We, indeed, are continuously and positively advancing RCEP negotiations," China’s deputy international trade representative Zhang Xiangchen told the briefing. 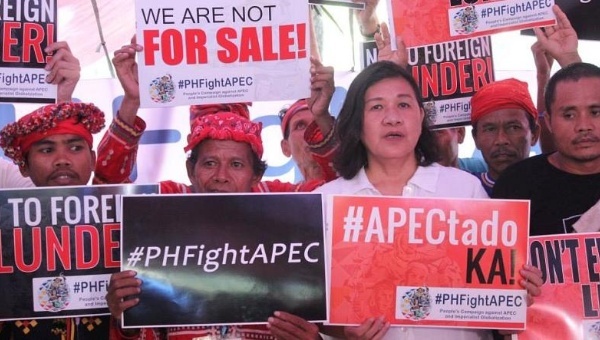 RCEP groups the 10 members of the Association of South East Asian Nations plus China, Japan, South Korea, India, Australia and New Zealand, but not the United States. Beijing had feared the United States would use the TPP to either force it to open markets by signing up or else to isolate it from other regional economies. Some see the demise of the TPP as an opportunity emerging for Beijing from Trump’s surprise victory, which also brings greater uncertainty for U.S.-China relations and the regional balance of power. Ruan Zongze, a former Chinese diplomat now with the China Institute of International Studies, said the TPP would be the "first casualty" of Trump’s election. Since China isn’t in that bloc, we don’t have anything to lose," Ruan said.